Hermon Girma is stirring bean stew over a wood-fed stove when she hears someone at the gate. She sends her 3-year-old son to slide open the piece of corrugated metal that separates her home and others from the cobblestone street in Kirkos, a neighborhood in Ethiopia’s burgeoning capital city, Addis Ababa. Tigist Seyoum, a sturdy 35-year-old woman with a large black purse and cornrowed braids, leans down to kiss the boy’s cheek as she enters. The community health worker and the boy’s mother sit on a sofa in the Girmas’ home—two tidy, small rooms crammed with furniture. They chat about neighborhood gossip and the family’s health, including checking on birth control prescriptions. Community health workers like Seyoum have helped Ethiopia reduce child mortality by two-thirds since 1990 and death from malaria, a common disease, by 55 percent. Since their deployment, contraception use among women—from longer-lasting injections to daily birth control pills—has doubled from 15 to almost 30 percent in six years. More than 8,000 miles away in Williamson, West Virginia, 34-year-old Samantha Runyon visits about 15 homes a week to check blood sugar levels and teach people with diabetes how to deliver insulin injections. The nurse, who works in the rural coal mining town where she grew up, is part of a team of four other “patient navigators” at a local nonprofit, the Diabetes Coalition. Her role is funded by a Duke University research grant aimed at curbing and treating diabetes. Across the world, countries have started to embrace community health workers as a means of reaching people who don’t always have regular access to care through clinics and hospitals. Community health workers curb health care costs by preventing complicated disease and emergency room visits. Their titles vary—India has more than 800,000 “accredited social health activists” and Malawi employs 11,000 “health extension workers,” but the impact seems to be universal. Not only do the workers treat and manage care, they also help curb health care costs by preventing complicated disease and emergency room visits. Their success depends partly on local connections. “The area where community health workers catch on is where they retain their community identity and their advocacy for their community and yet have a sharply defined role in their health care system,” said Columbia University’s Dr. Prabhjot Singh, chairman of the One Million Health Worker Campaign. In Ethiopia, community health workers like Seyoum have become an integral part of the tiered national health care system put in place in 2004 to reach mostly rural families vulnerable to disease, hunger and isolation. The country’s Ministry of Health employs 38,000 health extension workers—an all-women workforce of mostly high school graduates with one year of health training. There are also about 38,000 community health workers in the U.S., according to the Department of Labor, but their role is more loosely defined. There is no uniform training or accreditation process, and their responsibilities vary by state. The Affordable Care Act includes a section recognizing the need for community health workers, but no decisions were made about their funding, said Dr. Nell Brownstein from the Centers for Disease Control and Prevention’s Division for Heart Disease. Nevertheless, she said there is a big push from the both the health care system and states to build the workforce. Empirical research has continued to document their effectiveness—a 2009 study by the American Public Health Association, for example, found that community health workers’ intervention in the care of underserved men in Denver saved $2.28 for each dollar spent by redirecting people who would normally go to hospitals for care. Florida and Texas have thousands of community health workers that help manage chronic disease and educate communities. Massachusetts and Minnesota have led the way in passing legislation to define their role in the health care system. Many American communities still struggle with threadbare health systems that could benefit from an infusion of community health workers. Meanwhile, many American communities still struggle with threadbare health systems that could benefit from an infusion of community health workers. Until the 1950s, the town of War, West Virginia, thrived on coal production—an industry that kept movie theaters full on Wednesday evenings and powered the local economy. As mining declined, towns like War sank into depression. Now the main street is marked by empty windows and a chipped sign for the abandoned jail. Residents are resigned to traveling at least an hour and a half to cities like Bluefield and the state capital of Charleston for medical care. The burden of isolation and unemployment has taken a toll on families in the area, said Tiller, pointing to black and white photos of the town in more prosperous times. In today’s McDowell County, premature death rates are more than triple the national rate. Rampant prescription drug abuse has forced children of addicted parents into foster care. And around 30 percent of the population is obese. “People are angry, but they don’t know who they should be angry at,” said Annetta Tiller, who works as a health liaison for Big Creek People In Action, a local organization focused on health and education. Tiller, 37, is not immune to the local health system’s shortcomings. When she was diagnosed with colon cancer in 2007, she started to receive care from an oncologist in Bluefield, almost two hours away. Every week she would drive with her husband to receive chemotherapy, returning with her arm hooked up to a pump and bag of medicine, usually nauseated. Isolated areas are ideal for the kind of services that community health care workers provide. Columbia University’s Singh said isolated areas are ideal for the kind of services that community health care workers provide. And the lessons from reaching these areas in sub-Saharan Africa could be applied in the U.S. In Ethiopia, about 34,000 of the workers are recruited in rural areas where hospitals and clinics also can be hard to reach, according to the U.S. Agency for International Development. Tadesech Senbu, a community health worker, works in Gora Kataba, a bucolic area about two hours outside of Addis Ababa, where goats roam the road and many older women wear traditional long skirts and wrap cotton shawls around their heads. Senbu, a slight 23-year-old, and her colleague have a goal of reaching 500 families each in the area, where she grew up. They are trained to perform a host of specific health care duties, including administering birth control injections and delivering babies. For anything more complicated or not covered by the one-year curriculum, they are instructed to refer patients to regional health clinics, staffed by nurses and doctors. 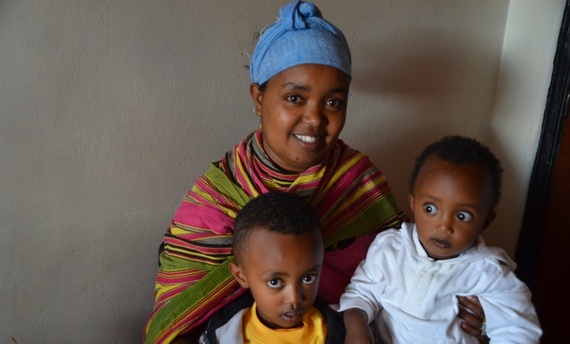 To communicate their message, Senbu said she holds coffee ceremonies—an Ethiopian tradition—to bring people together to discuss health issues, like keeping farm animals out of living spaces and ways to space pregnancies further apart for family planning. Seyoum, in Addis Ababa, said her work is driven by the sense of responsibility she feels for her community. That work is not easy—she visits at least 60 homes per day, armed with notebooks of data and basic medicines. But with families like the Girmas turning into models for the change she hopes to see in Ethiopia, she is optimistic about the future. The Atlantic: Dying Not Under a Bridge, Nor Living in an E.R.